Several factors are influencing the 2018 energy market, demanding UK brokers to put-forward new strategies and practices. Expertise in the area will be a key element to guarantee savings on contract renewals. For many years prior to summer 2016, wholesale energy prices were falling and forward curves for annual prices were generally in contango. Consequently, it was reasonably easy to meet or beat energy purchase budgets year on year; making it straightforward to get purchasing approvals. While it is true that fully made up retail prices may not have been dropping significantly, and were eventually increasing as time went on, this was primarily because of a general increase in taxes and levies required to promote and support renewable energy sources. This was largely perceived as out of anyone’s control and could not be influenced, although, in reality this may not have been true for all buyers. Throughout this time, many energy brokers, who were looking to aggressively increase customer numbers, also misinterpreted the contango forward-curves and often described them to consumers as forecasts, which appeared to support the argument to purchase earlier than necessary in order to close a deal. With prices moving down these purchases nevertheless looked good compared to previous years, even though in most cases delaying purchasing decisions would have been more beneficial – many of Pulse’s customers did take advantage of such contract flexibility and so achieved even better prices than the fixed prices being peddled by others. At the same time, Ofgem was encouraging new entrant suppliers, which, together with the active TPI sector, helped to create increased competitivity, further pushing prices down. Many of Pulse’s customers did take advantage of such contract flexibility and so achieved even better prices than the fixed prices being peddled by others. 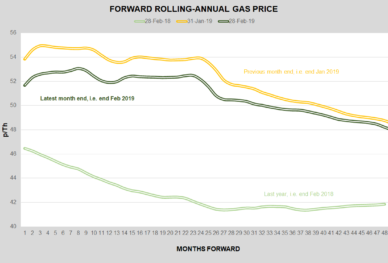 As mid-2016 approached and the market bottomed, coinciding with a structural shift as the forward curve for annual prices flipped to backwardation. Enabling consumers to cover forward years at lower prices – consumers also began better understand the market structure and learned that backwardation was actually a sign of an underlying stronger (bullish) market sentiment and so buying forward sooner rather than later was likely to be a good strategy. As time progressed markets became more difficult; prices rose and volatility increased. Whereas backwardation meant consumers could still buy forward years cheaper, overall price levels were higher and so beating budgets, aimed at achieving previous year’s levels became ever more difficult. As we move through 2018, all these challenges have increased. These difficult market conditions are also affecting suppliers, as evidenced by recent announcements by Centrica and the consolidation of many of the newer entrants, some of which have experienced business threatening risk management and financial performance issues. 1 – Thermal generation capacity mix has changed over recent years and will continue to do so going forward. Historically during the winter, when demand for gas is high for heating, coal-fired power generation helped to lessen the demand for gas for power generation. However, over recent years, emission regulations, including SOx, NOX and CO2, have all resulted in the gradual closure of coal-fired power generation plants particularly in the UK but also now impacting on countries like Germany, Spain and Poland, who have traditionally been large users of coal. This means in cold periods and at times when French Nuclear power generation or intermitted renewable power is restricted, gas-fired power generation is relied upon; often coinciding with high heating demand, resulting in high price volatility. 2 – The recent closure of the Rough storage facility has exaggerated the reduction in production capacity from the large Groningen gas field. Both these mean the market is increasingly reliant on conventional gas supply, i.e. Russian and Norwegian gas flows, and LNG deliveries, which are all very price sensitive. 3 – The increasing proportion of wind and solar power generation capacity, which is primarily driven by subsidy rather than the wholesale market, has not only added to production volatility but has also changed market drivers. Prices have become much more correlated to weather (temperature, wind, and sun) and far less correlated to supply/demand – peak demand no longer necessarily coincides with peak price – the market is not broken but really does need updating to reflect the modern generation mix. 4 – Oil prices have risen recently as the oil market supply/demand balanced and OPEC curtailed production levels, though whether this will be maintained as 2018 progresses is not obvious. All these factors support the likelihood of greater volatility. However, as new regulation comes in to ‘fix the market’, suppliers consolidate and subsidy incentives on the new generation, reducing the impact. Furthermore, the recent Capacity Auctions demonstrated National Grid is increasingly confident it has sufficient ‘reserve’ capacity to manage imbalances. While current conditions might suggest fixing forward energy prices could be the lower risk strategy, as spring turns to summer the possibility of contango returning becomes more likely and then flexible strategies with delayed purchasing will become the order of the day again, though today deciding which way to go is not obvious. It might surprise some, though in isolation Brexit is unlikely to have a major impact on the UK energy market. If we assume the energy market is indeed just that, it will ultimately be driven by fundamental factors, primarily supply and demand; remembering it is essentially a global market anyway, with the largest energy suppliers to Europe being Russia and Norway (neither part of the current EU 28), with renewables increasingly significant too. Yes, there could be macroeconomic impacts of Brexit, perhaps causing large-scale demand reduction and changes to FX rates, though many of the consequences will have opposing impacts on price. 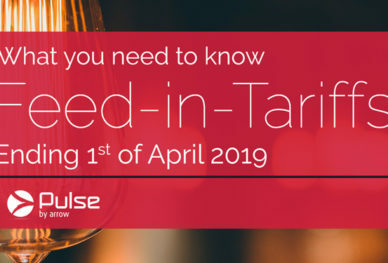 Furthermore, Europe is set up on a very integrated basis to allow multidirectional energy flows; technical issues may need to be finalised but it is in nobody’s interest to impose cross-border tariffs. Even the European Parliament’s recent study ‘The Impact of Brexit on the EU Energy System’ recognises that the energy-system impact of Brexit on EU citizens and companies will be limited. At Pulse, we are always keeping a close eye on the energy market. We can take care of all your invoices, bill validation, and money-saving strategies. Do you need Energy Procurement advice?